Jerome Veilleux, founder & owner of JV Roofing & Exteriors is from Saint-Georges de Beauce, Quebec. He grew up there, going to school & continued into a carpentry & construction course in Quebec. Since moving to the Red Deer, Alberta area over seven years ago, Jerome has become JV Roofing & Exteriors and has worked for many company's doing thousands of residential roofs & exteriors. His winter work has consisted of mostly commercial indoor project. Although he started with roofing, he now does various extensive exterior work as well. He's now working with three crews & is expanding constantly to suit Central Alberta & surrounding areas needs for roofing & exteriors . 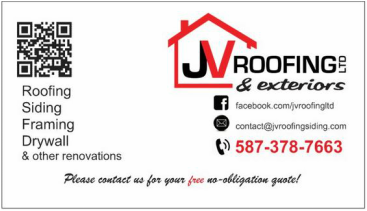 JV Roofing & Exteriors provides, roofing, siding, soffit, fascia, windows, doors, framing & even dry walling.